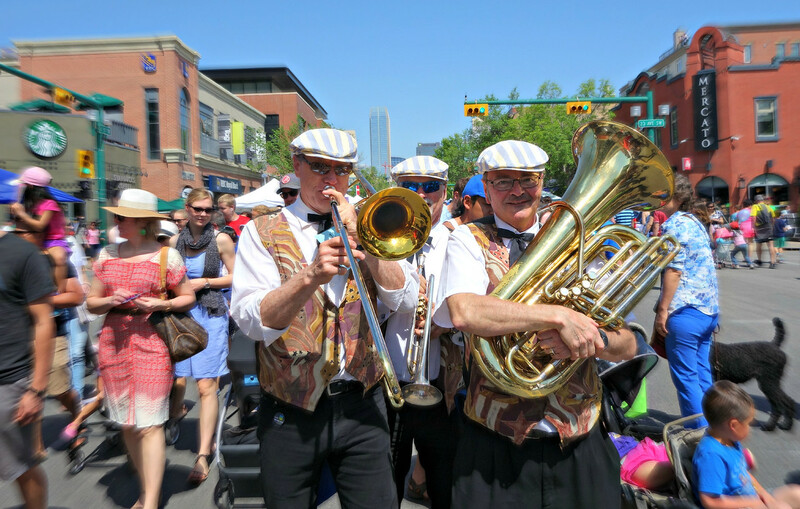 This past Sunday we joined (practically) everyone in Calgary for the 4th Street Lilac Festival. It was a perfect sunny day and everyone was happy to get out and enjoy the live music, food, artists and people-watching. 4th Street is part of Calgary’s Mission District, with numerous great restaurants, shops and art galleries. 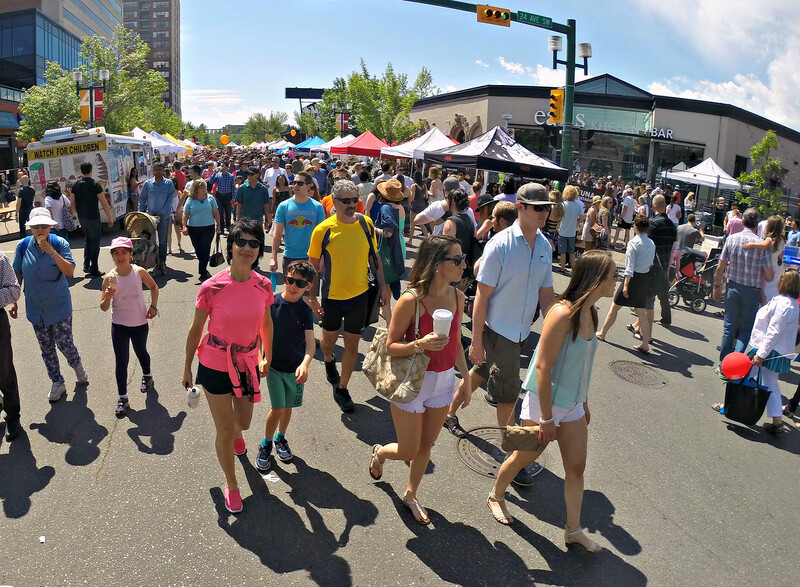 Today the street was pedestrian only, with more than 500 vendors showcasing arts and crafts, organizations and charities, and of course lots of food. Many of the food vendors were mini versions of 4th street restaurants, so it was a great way to sample their offerings. Our favourite was the bratwurst from Wurst. If you missed the 4th Street Lilac Festival, don’t despair! 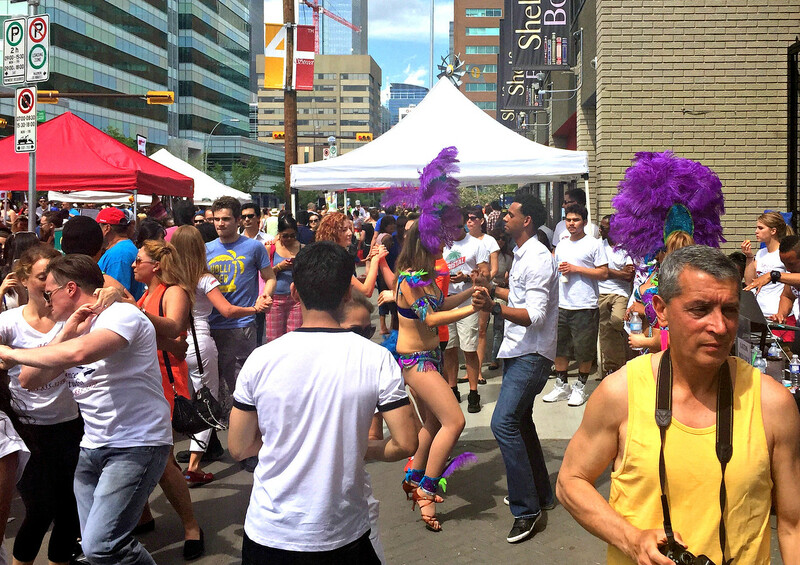 Here’s a roundup of Calgary summer festivals. If you would like more information about the next Lilac Festival check the official Lilac Festival website. Do you have any festival plans this summer? I love the smell of lilacs. Did they permeate the air? What a great day in the outdoors! What’s not to like about a lilac festival I’d love to attend the Calgary 4th Street Lilac Festival. Hope I do someday. I especially enjoyed the image of the lady all in lilac. Lovely. Street festivals are the best! And I love your colorful photos of people enjoying themselves! I love seeing and smelling the lilacs at this time of year. I did not know Calgary had a lilac festival. It must be a reaction to the end of long winters, but Canadian cities seem to have constant summer festivals. That certainly seems to be the case in my home of Winnipeg. You’re so right. After the long winters we’re ready to get outdoors as much as we can! I missed the lilacs–and the peonies–in Minneapolis this spring, so it is fun to see your photo essay on Calgary’s Lilac Festival. We are hoping for a road trip through Calgary, but it will probably by in the fall. Fall is still a great time to visit. Maybe we can meet up when you’re in town. Love street festivals! So full of energy, always great seeing everyone involved and all the great activities happening. Great photos. Lilac Festival looks like a good time! Great photos Shelley!. I used to live in Mission District, over on 2nd St SE and 26th Avenue. It was such a great location. I will by in Calgary next summer, possibly in time for the 2016 4th Street Lilac Festival. I am looking forward to Calgary’s summer festivals – they’ve added a lot more since I lived in Calgary back in the ’90s. You lived in a great location! Calgary has changed a lot for the better over the past few years. The East Village area and new National Music Centre should be completed by the time you visit in 2016.